Until yesterday, every physicist was laughing at this engine and its inventor, Roger Shawyer. 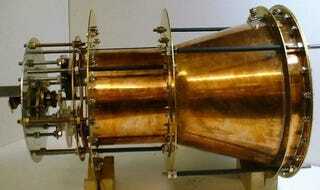 It's called the EmDrive and everyone said it was impossible because it goes against classical mechanics. But the fact is that the quantum vacuum plasma thruster works and scientists can't explain why. Shawyer's engine is extremely light and simple. It provides a thrust by "bouncing microwaves around in a closed container." The microwaves are generated using electricity that can be provided by solar energy. No propellant is necessary, which means that this thrusters can work forever unless a hardware failure occurs. If real, this would be a major breakthrough in space propulsion technology. Obviously, the entire thing sounded preposterous to everyone. In theory, this thing shouldn't work at all. So people laughed and laughed and ignored him. Everyone except a team of Chinese scientists. They built one in 2009 and it worked: They claimed they were able to produce 720 millinewton, which is reportedly enough to build a satellite thruster. And still, nobody else believed it. Test results indicate that the RF resonant cavity thruster design, which is unique as an electric propulsion device, is producing a force that is not attributable to any classical electromagnetic phenomenon and therefore is potentially demonstrating an interaction with the quantum vacuum virtual plasma. The entire idea that we have found something that seems to go against the the principle of conservation of momentum just seems crazy to me. But the fact that it has worked for two independent parties can't be denied. That's the laboratory speaking. Then again, perhaps both labs made a mistake. I'm sure this will be tested by the Russians and the Europeans too, but at least I'm glad we are working on it. But the fact that we may be witnessing something completely new, something that may push us forward into sci-fi territory once again, is very exciting. Thanks to Gizmodo Spanish. If you talk Spanish, follow them here. They always have great stuff before everyone else.